This dressing is sweet, tangy, and easy to make. I originally found it on the blog Fructose Schmuctose and Diabetes to Boot and have made a few small tweaks. 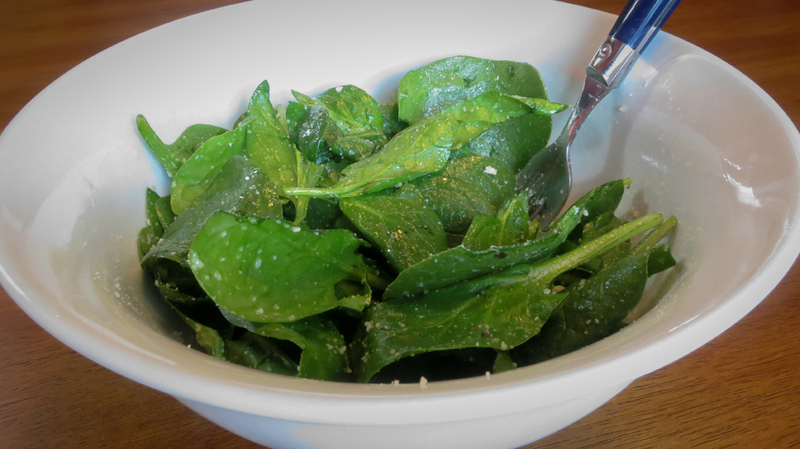 I put it on spinach and eat it every day! Mix it all together well and store in the fridge (this means you’ll have to heat it up every day since the olive oil will solidify). I usually split mine up into 3 small containers so I can bring one in my lunch bag. If you do something like this, make sure you alternate pouring small amounts into each container, because no matter how fast you pour after mixing, the olive oil floats to the top and the sugar sinks to the bottom. So make sure you get enough sugar into each! This entry was posted in Recipes and tagged elimination diet, fructose malabsorption, olive oil, salad dressing, white rice vinegar by nosugarlessgum. Bookmark the permalink. Awesome, I’m making this tonight! We got our first box of veggies from the CSA we signed up for before I got diagnosed, so I was panicking with how I was going to eat all this salad! I hope you like it! Let me know how it turns out! It turned out pretty good! I ended up sauteing some braising greens, topping them with cubed potatoes and putting the dressing on top. Ooh, sounds good! Thanks for letting me know! Was this ok for you – doesn’t lemon have fructose in it? New to site and fm- trying to figure it out for my son. Lemon is on the very low end of the fructose spectrum so it should be just fine! I’ve never had a reaction to it. Have you checked out my recipes page? The recipes that are starred are the ones for people new to the FM diet and that would be a good place to start for your son! I cannot thank you enough for this recipe. I’ve been having a hard time learning how to deal with being FM, and have been craving a good salad dressing and this was perfect. Thanks!! I’m so glad! Starting out is definitely the most difficult time. Hang in there! Hi, can you please tell me how long this dressing keeps refrigerated? I used it for about a week. I think it could probably be ok for longer since lemon juice is a natural preservative but I can’t say for sure!